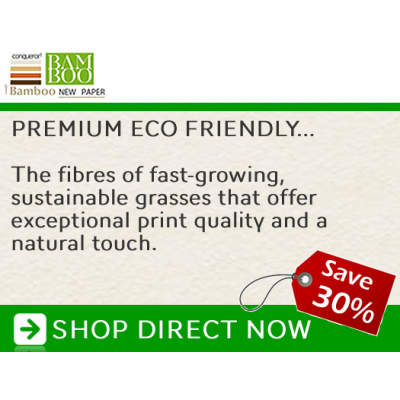 A stunning new eco range! Conqueror Bamboo is the ultimate eco alternative with bamboo renewing itself every 12 months. 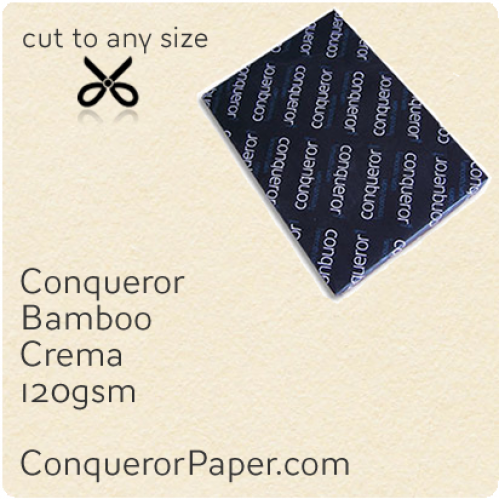 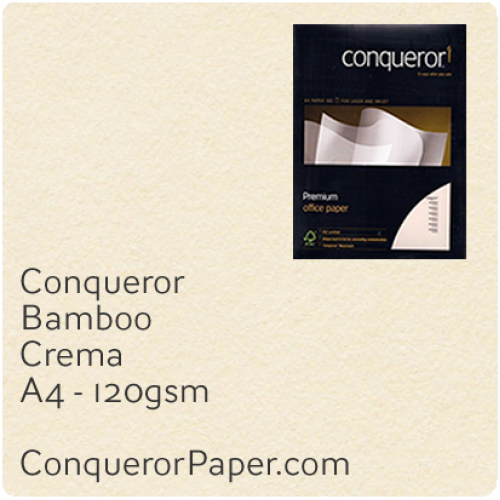 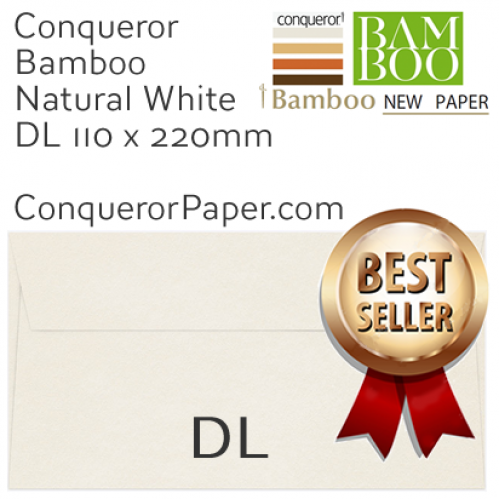 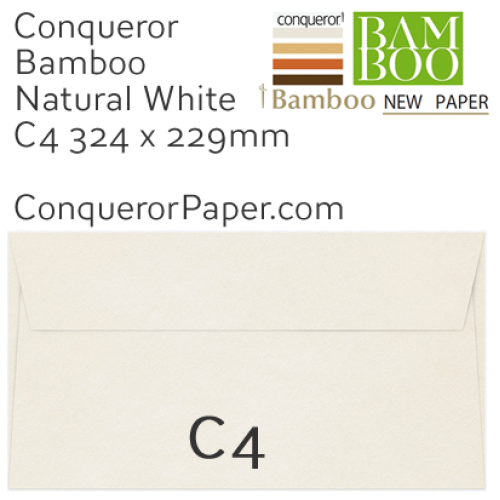 This new addition to the Conqueror range offers the same quality and credibility to your business messages as the other finishes in the range, but with the additional benefit of enhancing your environmental credentials as it is made from high yield renewable Bamboo sources. WINDOW = No SIZE = DL 110 x 220mm TYPE = Wallet (flap on long edge) FLAP = Super Seal (Peel and Seal) COLOUR = Crema TEXTURE = Bamboo ..
Prestige Envelope* Brand CONQUEROR TINT: Crema FINISH: Print Excellence Bamboo PAPER: 100 gsm SIZ..
Prestige Brand CONQUEROR Paper Highest Quality TINT: Crema FINISH: Print Excellence Bamboo PAPER: 120 gsm SI..
Prestige Brand CONQUEROR Paper Highest Quality TINT: Crema FINISH: Print Excellence Bamboo PAPER: 120 gsm ..
Prestige Brand CONQUEROR Paper Highest Quality TINT: Crema FINISH: Bamboo PAPER: 250 gsm SIZE: B1 - 700x1000mm ..
Prestige Brand CONQUEROR Paper Highest Quality TINT: Crema FINISH: Bamboo PAPER: 400 gsm SIZE: B1 - 700x1000mm ..